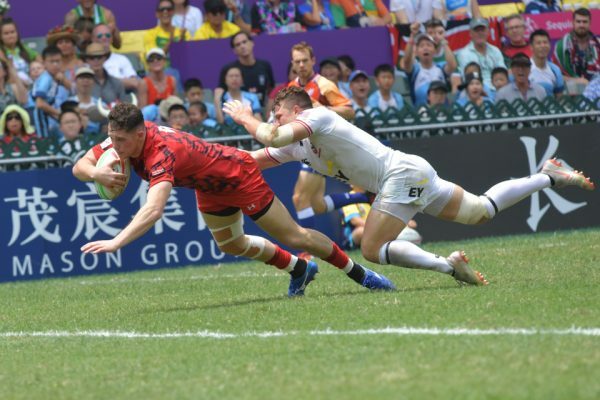 HONG KONG─The weather was as hot as the rugby on Day 3 and what a day it was from start to finish. There were twists and turns, and every side upped their game in front of a packed house at the Hong Kong Stadium. England, South Africa, Fiji and France walked away wining all three pool matches. Whilst New Zealand, USA, Argentina and Samoa all sealed second spot in their respective groups to progress to the quarter finals. 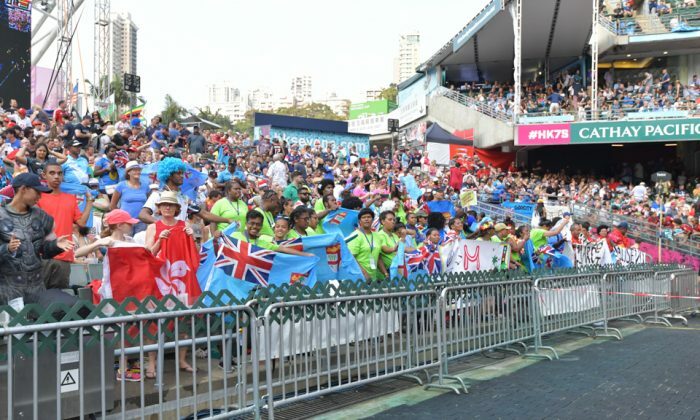 Defending Champions Fiji and New Zealand played in Pool C, the “group of death”, with a young Fiji team romping home 24-5 over the All Blacks to top the table. As both sides had already progressed to the Cup quarter finals, there were some suggestions the Kiwi’s were playing mind games by losing to secure an easier semi-final opponent in either England or Samoa, rather than the USA or South Africa. Fiji and New Zealand are again seeded to meet in the final. 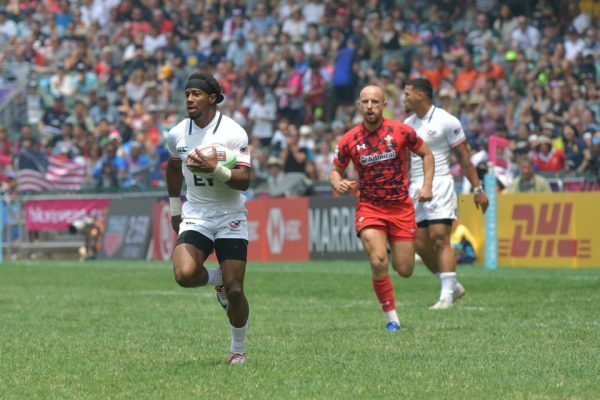 With speedster Perry Baker injuring his jaw in Hamilton and not in Hong Kong, the Americans had to rely on Carlin Isles for gas, and stuttered losing two pool matches, to Wales and England, although luckily edging through over Wales on points difference. Therefore, the Cup quarter-finals are South Africa v USA, Fiji v Argentina, England v Samoa and France v New Zealand. In the Qualifier quarter-finals, the scores were Germany 12-7 Uruguay, Ireland 47-0 Russia, Chile 15-12 Tonga and Hong Kong 17-7 Philippines. So the home side will progress along with three higher seeded teams and play Chile next. Last year’s runner’s up play favorites Ireland. In the Women’s semi-finals, Brazil beat Kenya 17-5 and Scotland took their revenge over Japan for beating them in the pool stage, by winning theirs 24-19. However, unbeaten Brazil ended any Scottish hopes of an upset, winning 28-19 in an entertaining final. It’s a very open main competition this year with the top four teams automatically progressing to the Olympics in Tokyo in 2020, so tomorrow’s quarter finals should be closely contested, whilst keeping the decent Sun-baked and noisy crowds on the edge of their seats. Andrew Wood is a sporting enthusiast, sport player in Hong Kong and contributor to Epoch Times.